Directions for use: Mix yeast with flour for 30 seconds then proceed with normal mixing. Avoid contact with ice or cold water. Instant dry yeast may be added directly to flour without being activated and used in place of expensive refrigerated active yeast. 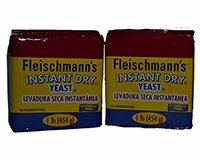 When converting from fresh yeast, add additional water equal to 2 times the amount of instant yeast used. 2 1/4 tsp of bulk yeast = 7g package of dry yeast.